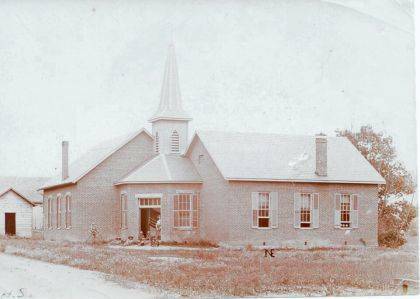 Circa 1900 photo (#1767) of Terre Haute School (DIST 10 – Sec 19), Mad River Township, Champaign Co. The school located between Storms Creek and Storms Creek Road, about 3/8-mile east of state Route 55. A.B. Graham taught at the school 1896-1900 (room at left). The building burned in 1902 and was rebuilt the same year. A new building was erected in 1915. High school transferred to Westville in 1944 and the remaining grades transferred to Graham school district in 1963. Early Schools of Champaign County, Ohio 1997 Champaign County Genealogical Society. The Champaign County Historical Society is an all-volunteer, not-for-profit organization that preserves, protects, archives and displays the artifacts that tell Champaign County’s History. The Society operates on donations and dues and has a free public museum of history at East Lawn Avenue in Urbana.